Dividing his time between Winnipeg Canada and southern California - Walle is intensely devoted to his craft - and a creative imagination second to none, Larsson has been wowing audiences from New York to Montreal, Toronto to Tokyo with sizzling jazz solos and sultry smooth jazz. Over that time, the six-foot-four Larsson - who possesses a strong stage presence characterized by not only his larger-than life silhouette, but the ability to interact with audiences in a warm, genuine manner - has shared the stage with the likes of legendary jazz greats Mel Torme and the ageless Tony Bennett. As Entertainment Liaison for The Lyric Theatre in Winnipeg, Walle has used his extensive music connections to bring in - and then back - world-class artists such as as keyboardist Jeff Lorber, saxophonists Dave Koz and Richard Elliot guitarists Brian Hughes, Mark Antoine and Nick Colionne. At his best live - Larsson's improvisational skills are second-to-none - Walle has recorded six albums, starting with The Walle Larsson Band, recorded in his hometown of Winnipeg in 1991. 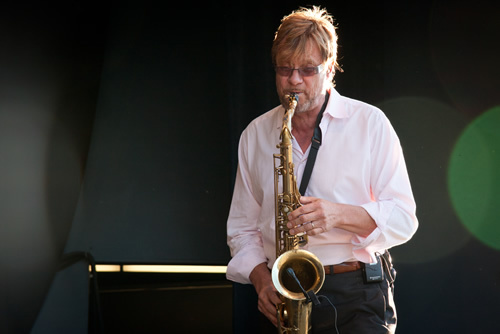 On the strength of that album, Larsson was invited to play at the Montreal Jazz Festival and was then summoned to New York to showcase his skills for Bluenote Records. In 2010, Walle released his fifth album, After the Night. Containing 10 Larsson originals that range from sultry smooth jazz to Latin-flavored funk, it proved that he was simply getting better with age; an example of his ever-improving skills can be found on the CD's title track, where Larsson's sax soared on After the Night which garnered Larsson a Billboard top twenty and a New York Music Choice Singles Chart #1. The second single from this CD also pulled off a Billboard top 20. In 2014 Larsson was a guest performer on The Dave Koz Friends at sea Mediterranean cruise. In the fall 2015 Walle performed again on Koz's Alaskan cruise, performed with his band at the Bahamas Jazz Festival and toured Israel with the I.H.S big band out of Switzerland. Later this year Larsson has been invited to perform a two-week stint in Vietnam. Always an ambassador for smooth jazz, Walle hosted a groove jazz show on Winnipeg's Magic 99.9 FM and Groove F.M. for 10 years. At the same time, he played regularly at venues around the city, his skills ever improving. He recorded more CD's, and became Entertainment Liaison for The Lyric Theatre at Assiniboine Park, establishing himself as an ambassador for contemporary jazz not only in Winnipeg, but western Canada.